The Most Versatile Salad Spinner Out There! If you are searching for a lettuce spinner that does a bit more than spin your lettuce, you’ve found it here! Caraselle’s brand new Salad Spinner, is also a mixing jug and a measuring jug! It’s microwave safe which means you can steam your vegetables in the microwave too! 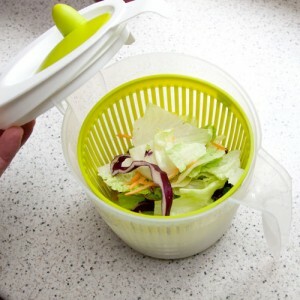 Unlike other salad spinners being a jug you can pour off the excess water after you’ve spin-dryed your salad. Unlike other lettuce spinners it’s compact so won’t take up lots of cupboard space.In fact this is one item you may want to leave out because it’s so useful you’ll want to keep it handy! It’s also useful for keeping water and juices in your fridge, plus being dishwasher safe cleaning it is a doddle too! Why get one salad spinner when you can have one jug that can spin your salad and do so much more! A really useful kitchen tool!